For some reason, parallel parking seems to cause problems for many drivers. Of course, there are some who have no problems with it at all, but they seem to be a minority these days. If you are among the populous that has not yet mastered the art of parallel parking, Ford has joined the handful of other manufactures to offer a solution. 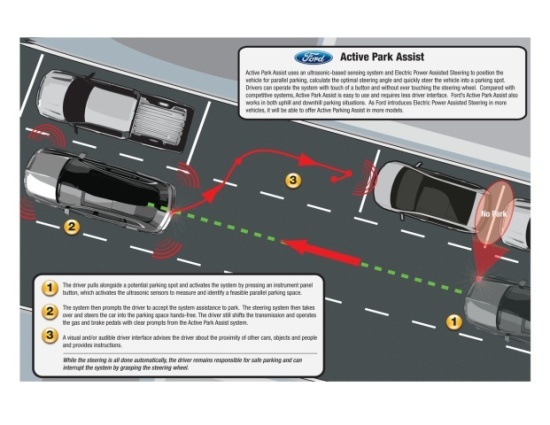 Ford's Active Park Assist system uses the ultrasonic sensors already on the vehicle to identify an open space, and then when commanded to do so, it will steer the vehicle in to the correct position. The only real addition to the vehicle was an electric power steering system that would work in conjunction with the parking system. The whole process beings with the sensors measuring the distance between parked vehicles to determine if there is enough space to park your vehicle. From there, the system will tell the driver when to shift into park/drive and also provide instruction on braking and accelerating. According to Ford, the system is much more reliable than traditional camera based systems that are currently in use. Active Park Assist is set to make its debut on the 2009 Lincoln MKS and MKT. VibriSee: Ain't Those The Cat's Whiskers?